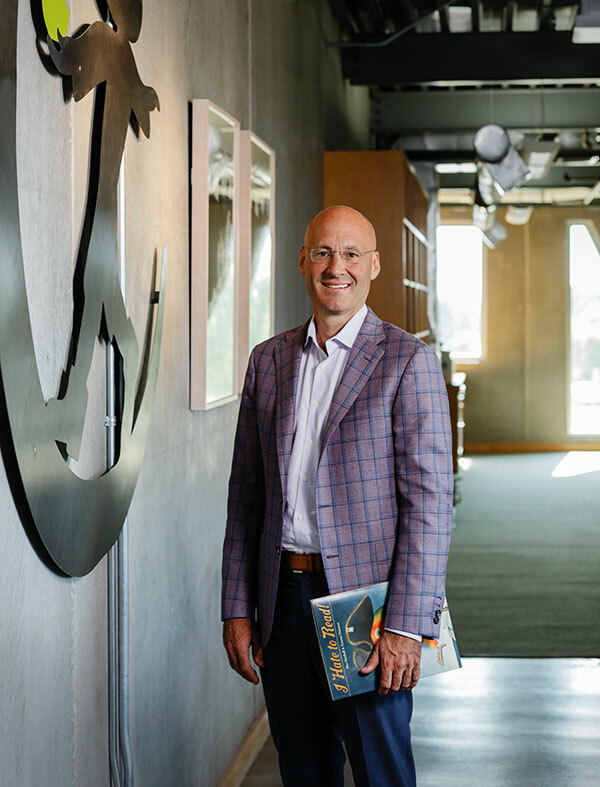 Tom Peterson’s family built a publishing business over three generations by adapting to changes and staying true to their belief in the power of the written word. The history of what we now know as The Creative Company began in 1932, as two friends saw a niche they could fill right from their hometown. A visionary named George Peterson, along with his close friend, Jim Mackin, started The Creative Educational Society. The duo produced maps and diagrams for use in classrooms. Items included such educational tools as chalk game sets called Pla-boards and their best seller; a boxed set of more than 500 rubber stamps called the Creative Pictured Printer. 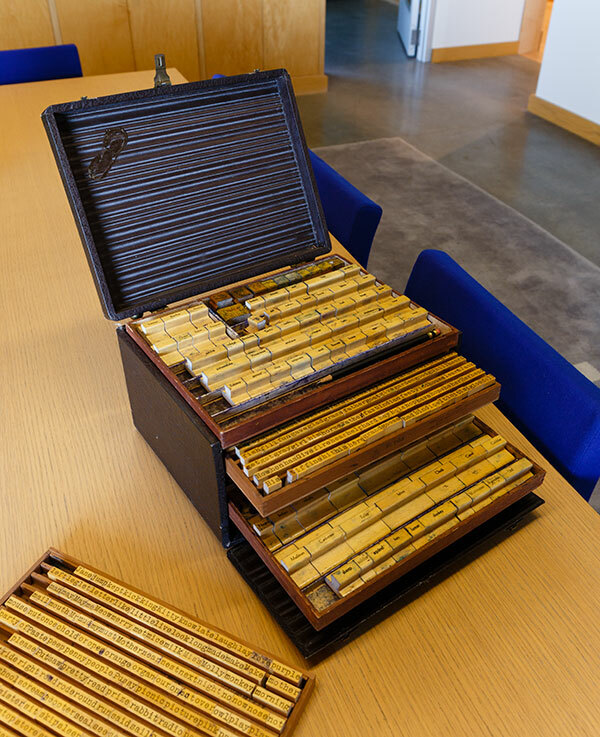 In fact, Peterson keeps an original stamp set in its beautifully ornate box in Creative’s editorial offices. A reminder to him of how the company began. One of The Creative Company’s first products, a rubber stamp set. The evolution from rubber stamps to the supplementary reading books Creative publishes today was really born out of necessity. Not to be deterred, George Peterson and his partner quickly diversified but chose to stay with the school market because they already had built relationships. That’s when they started producing textbooks on topics that ranged from science to sports. In the 1960s, George Peterson Jr. joined the company and continued the transformation that eventually paved the way to making Creative a leading children’s publisher in the United States and around the world. “My dad really changed the nature and the format of our content. From textbooks meant for classroom use to library books used for recreational reading and report writing, my dad created the road that we still travel today. He broadened the offerings, he changed the package, he created a new editorial direction, and ultimately he found a new customer within the school building—the librarian,” says Tom. “My dad’s books in the late 60s through the mid-80s ran the gamut of the curriculum. Like our publishing program today, there really wasn’t a topic he didn’t cover.” But perhaps that wasn’t the most important thing he did for Creative. His curiosity went beyond the schools and libraries in the United States and he was bold enough to believe that a small, independent publisher from Mankato, Minnesota might be able to find interest in their books well beyond this nation’s borders. Some thirty years later, Creative’s books reach every continent of the world and have been published in more than 35 languages. From the Faroe Islands to China the content and design of Creative’s books have found readers and admirers the world over. The books Tom publishes are world renowned for their beauty, illustration, editorial edge, and enduring educational value. But whereas the company’s history is well illustrated, the future is a blank page. The leap from those original chalk sets and rubber stamps to beautifully illustrated and well written books though, did take vision. As George Peterson, then George Peterson Jr., and now the third generation, Tom have all managed to do is stick to their foundation and ride out the ups and downs of the industry, technology advances, and evolving formats and tastes of their customers. That passion, and always working on the belief that kids are smart, has proven to be a good business plan. In the more than eight decades since the company began it has experienced name changes, personnel changes and market changes. It has endured its share of hurdles, but it has also embraced opportunities. Operating as The Creative Company today, it has almost 2,000 books in print and over 5,000 to its credit. Working quietly from editorial offices in a beautiful vintage home on South Broad Street, Tom talks about the evolution of the company and how they stay relevant in the digital age. Was it always in your plan to follow in your grandfather and father’s footsteps? Not at all! In 1985 I graduated from college and was going to do a brief stop in Mankato on my way to law school. I started working here that summer and when school started in August I tried to get out the front door but it was locked from the outside! And I haven’t been allowed to leave since. When I started in ‘85, it was my dad, a long-time assistant, and me. Today, we employ 60 people in two different locations in Mankato and North Mankato. It’s grown beyond my wildest dreams. But it was never part of a plan or intention. Even today I look around and wonder where all these people, the buildings came from—it must be some kind of April Fool’s Day prank! When did you buy the company? I had the honor to purchase the company from my dad in 1999. The company has changed a lot since then – more books, more people, more markets. We have surrounded our core educational product with more retail-related books, primarily picture books. But, nonfiction and educational books remain the foundation of the company. How do you know what titles to publish each year? By the eclectic nature of our list one might think it was determined by the direction of the wind, but primarily it is dictated by state educational curriculums. Anything a student would study in school, we are likely to have a book on that topic. Experience also plays a role as does what kids like to read. If a child, if a student is given books they enjoy reading at an early age, studies show that they are more likely to develop a love of reading. And although I may be extremely biased whether you are a writer, a doctor, a scientist or any other profession an individual’s education and much of their success is based upon their ability to read and comprehend the written word – even in today’s digital age. Has increased digital competition and ebooks had much of an impact on The Creative Company? The internet and digital content has certainly changed the landscape of our entire lives, and that’s true of the educational market as well. As far as the book industry is concerned, I believe ebooks, in particular, were a solution looking for a problem. While there was a great push for ebooks three or four years ago, it’s waned considerably now. The internet, of course, has made a much more dramatic impact, but even there Creative has been insulated a bit. Most of our books are for children ages 5 to 10, grades K-4, and students’ use of the internet for research purposes at that age is limited; books are still the trusted standard. But there’s also, in my opinion, a real digital divide not only in the educational system but in America too. Here in our region most of us are lucky enough to have access to computers and relatively easy and affordable Wi-Fi connections. Unfortunately, that is not true in some parts of our country. Some homes don’t have computers, even more do not have internet access; that is a significant challenge the digital age has not been able to overcome yet. To that point, I heard a National Public Radio editorial recently that said if the ‘book’ were invented today it would be the greatest invention of our time. In 24, 32, 80, 200 pages or more, it is a myriad of information, an imagination’s worth of fantasy, on any subject you could imagine. Carefully edited, easily read, the information, these different worlds are immediately at your fingertips. And best of all no electricity, no batteries, no power cords are needed. Easily taken to the beach, to the park, anywhere you want and the book is easily carried and easily used – no instructions necessary, virus tainted upgrades to come! So despite the digital threat, your demand continues to increase? I don’t think demand has necessarily increased. If anything it has decreased as school budgets have been consistently cut for books. When I started in the 80s not only did every school have a library, but every school had a librarian. The library was the heart of the school. Today schools are very different. For example, there may be one librarian for an entire school district. And when a school loses their librarian, well, it has a dramatic impact. Librarians, as much as anyone in a school building, are a champion for the written word, a champion of imagination, of learning. Take that focal point away and education changes. Many schools, many school districts have lost that focal point, the attention to the written word is diverted. As a result the librarian role gets filtered into the classroom, spread across a multitude of teachers, administrators, and volunteers, who while talented and concerned, have many other important responsibilities as well. It is a challenging situation. I know for you, meeting that challenge does not mean lowering your standards. The positive side of digital advances is that it has made producing books much less expensive than it was twenty years ago. So the ability to produce our printed material much more efficiently, more cost effective helps balance out the loss of school budget monies. And just as importantly it has allowed us to maintain our high production and quality standards. I like to think we publish books at Creative a little differently than most publishers. We publish high-end content for people who love and appreciate the printed word, people who expect to be challenged, entertained, and educated all at the same time. That is not the publishing model for most, it does not work for everyone, but we are fortunate it has and it continues to work for Creative. Much of the publishing world has been what I call “Disneyfied,” producing content that is often inexpensive and takes the rough edges off almost any experience in life. Disney, in particular, has done it with amazing success and to the enjoyment of generations. But the last thing, in my opinion, that the publishing world needs is a small publisher trying to copy what a large publisher already does so well. We need to be unique, we need to provide a different perspective, we need to respect and challenge the intelligence of young readers – they are able to learn and appreciate so much more than we adults often give them credit for. Please walk us through the process. So, we have two realms here; an educational catalog of work and a retail catalog. The process for each is a little different. For the educational/school market side, the catalog (Creative Education) is full of nonfiction books. The ideas for these books are developed in house and then we have a network of freelance authors who specialize in not only the content, but writing for children. These books are imagined, formatted, and created almost entirely by Creative’s editorial and design team. These talented people determine everything from the word count, to page count, to the design, and illustrations needed. The retail side of our publishing program is different. Books published for that imprint are (Creative Editions) picture books. The development of these titles is almost entirely driven by the author and/or illustrator of the book. These individuals may live in Mankato or they may live in Madrid. The origin of the idea matter not, only the quality of the message. Over the past thirty years now, we have been fortunate to work with some of the best children’s authors and illustrators working in the world. Individuals with remarkable talents, fantastic ideas, and a passion for children and books that I have been blessed to be around. The opportunity to work with people who are the best in the world at what they do has been an unbelievably rewarding experience for me. Our role in the creation of these books is really only to be a guiding hand, a supportive voice. The best thing I can do with these books is to get out of the creators’ way and let their talents shine through. Creative Editions is a very exclusive publishing list, known amongst publishers, illustrators, and authors the world over. We’ve published books in 35 different languages, in the past 25 years. The international market has become a very important part of what we do. I’m very proud of that. The educational side remains your base. Yes, the educational market is the foundation of any economic, publishing success we might have. Without the successes in the educational market, the retail market would not exist for us. Education is our business, picture books is our passion. You have two locations here? Our editorial offices are on Broad Street in Mankato and we have a distribution center in North Mankato. The facilities are home to Creative and the other important publishing various imprints we’ve developed over the last 10 to15 years. Those imprints include Amicus, Black Rabbit Books, and RiverStream. Each imprint has its own niche and is critically important to the overall success of The Creative Company. We would not be who we are today without the strength of each of those publishing imprints. 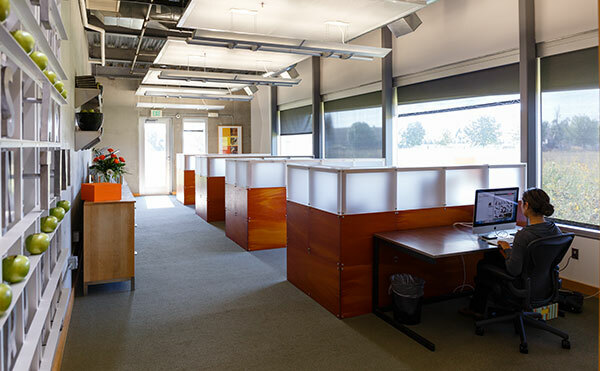 A workspace in The Creative Company’s North Mankato location. No. We’ve never been tempted to move the company. Mankato is home. It will be home as long as I’m involved. With the colleges here, Minnesota State, Gustavus, Bethany and South Central, we have great access to people with editorial, design, and management skills. With a multitude of resources like this I’ve never had thoughts of leaving the area. My grandfather and father set us up well! We have 10 people here in the editorial offices and 50 in the North Mankato building. How many books do you typically publish in a year? We publish approximately 450 books a year. The print quantity typically ranges from 1,000 to 20,000 depending on title and audience. In rare occasions we’ve had books print over 200,000 copies and in as many as 17 languages at one time. We print the majority of our books in North Mankato with CG Books, a division of Taylor Company. We keep our printing local as much as we can. When printing for other companies worldwide, however, printing in places such as Italy and China has become important. Our sales force is spread out and varied. We have independent reps, we have telemarketers, and we have an inside sales and marketing team. Our telemarketing division is run in partnership with a Canadian company (Saunders Book Company) and reached schools throughout North America. For retail sales, we partner with a publishing company out of San Francisco called, Chronicle Books. They are known for their unique and beautiful publishing program, but also distribute several small publishers like ourselves. I know you don’t like to look too far ahead, but any changes anticipated? When not in the office, Peterson enjoys spending time with his four children. Samantha is 26 years old, Madeline is 25, Anna is 22 and John is 21 and a student at St. Thomas University. Peterson seems to have balanced personal interests including arts and sports. As The Creative Company evolved, it developed four distinct imprints from which to operate. Creative Education is their nonfiction division that keeps the company connected to its roots. Creative Editions, founded in 1992, publishes picture books that are world renowned for their beauty and innovation. Creative Paperbacks focuses on soft cover versions of nonfiction and fiction titles. It was founded in 2000. And finally there is the youngest imprint, Creative Digital, which features a collection of ebooks. No matter which imprint is represented, The Creative Company maintains its longstanding dedication to publishing innovative and beautiful books. A 2016 survey done by Nielsen’s found an increase in sales of printed children’s fiction books. 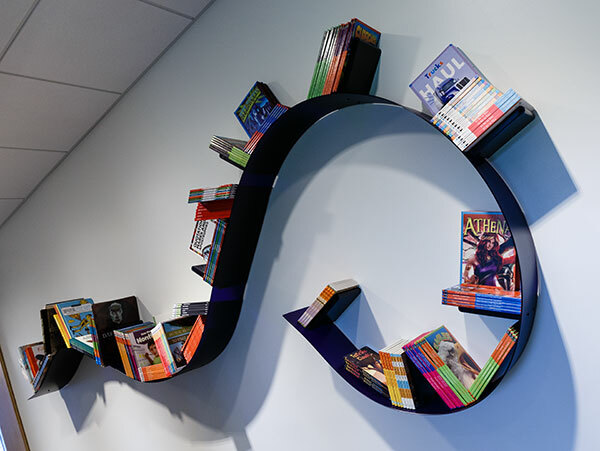 Nielsen attributed the increase to younger generations preferring physical books to ebooks. Steve Bohme, research director at Nielsen Book Research UK, believes young people use books as a break from their devices or social media. Plus, Bohme points out, some books just translate better in print form. While the list of awards and accolades is too long for this publication, here are some of the more recent recognition The Creative Company has received. I purchased one of yourCreative Pictured Printer ( the type pictured in the Sept. 1,1917 Connect Business magazine article) at an antique store. It is in new condition and am interested in selling it. I was wondering if your company might be interested in acquiring this piece of history. Thank you for any response to this inquiry.